This view taken from inside the Cupola shows the Orbital ATK space freighter moments before it was grappled with the Canadarm2 robotic arm on May 24, 2018. 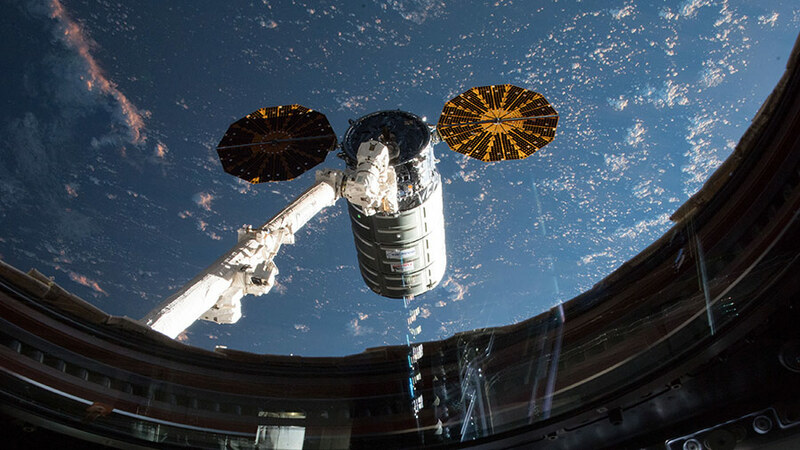 The Cygnus resupply ship from Orbital ATK is now open for business and the Expedition 55 crew has begun unloading the 7,400 pounds of cargo it delivered Thursday morning. The orbital residents are also conducting space research and preparing for a crew swap in early June. There are now four spaceships parked at the International Space Station, the newest one having arrived to resupply the crew early Thursday morning. Astronauts Drew Feustel and Norishige Kanai opened Cygnus’ hatches shortly after it was installed to the Unity module. The cargo carrier will remain attached to the station until July so the astronauts can offload new supplies and repack Cygnus with trash. NASA astronaut Scott Tingle, who caught Cygnus with the Canadarm2 robotic arm, swapped out gear inside a small life science research facility today called TangoLab-1. Tingle also joined Kanai later in the day transferring frozen biological samples from the Destiny lab module to the Kibo lab module. The duo also joined Commander Anton Shkaplerov and continued to pack gear and check spacesuits ahead of their return to Earth on June 3 inside the Soyuz MS-07 spaceship. When the three crewmates land in Kazakhstan, about three and a half hours after undocking, the trio will have spent 168 days in space and conducted one spacewalk each. Three new Expedition 56-57 crew members, waiting to replace the homebound station crew, are counting down to a June 6 launch to space. Astronauts Serena Auñón-Chancellor and Alexander Gerst will take a two-day ride to the space station with cosmonaut Sergey Prokopyev inside the Soyuz MS-09 spacecraft for a six-month mission aboard the orbital laboratory. Muito bom. As notícias sobre a NASA e a E EU me fascinam.